Jazz music is an American founded coalescence of instrumental diversity and culturally rooted emotion, originally manifesting itself in Africa American communities as a means of bonding the young and old together with tradition. Jazz first grew out from wordless storytelling; it was a means of expressing African and Slave Folk songs as brought to New Orleans with slaves from West Africa. Following this, American Jazz found its home in New Orleans in the late 19th and 20th century, in a place where Europeanization was met with the richness of African American communities there, in turn creating a fusion of European music with rhythmic African elements. Interestingly, the origin of the word Jazz is as uncertain as the notes, which define its pieces. Most experts believe it was nothing more than a slang term used as early as 1915 to name this new and unique form of expression. 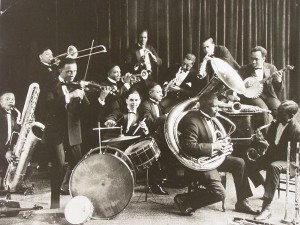 Nevertheless, as Jazz grew into a beloved American genre, its name became something of great importance as well; and in 1916 the American Dialect Society named Jazz, “The Word of the Twentieth Century.” This was a period where America saw immense growth in immigrant populations, and a time when many cultures were adopting the styles of jazz and transforming it to mesh with their own country’s roots as well. From Jazz many new genres of music found their roots as well, including swing. Due to its versatile and unpredictable nature, a result of playing in the streets, Jazz has a heavy improvisational foundation, encompassing its mixed cultures with traces of polyrhythm, syncopation, and the swung note. This eccentric genre of music is widely considered one of America’s first and greatest art forms, and truly regarded as a representation of America as it is a musical melting pot where the unexpected collide; sometimes seamlessly, sometimes painfully, but nevertheless together and arguably more colorful than any other genre of music. Like any other genre of music, Jazz has evolved since its start and continues to do so with every decade. In the 1930s, the most prominent style of Jazz music was the class bebop and big band arrangements that filled dance halls with unstoppable energy. 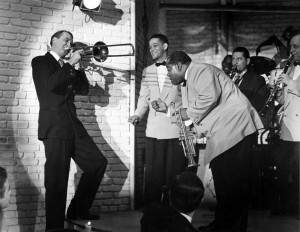 It was indeed from this period that some of Jazz’s most starlit names arose, such as Louis Armstrong, Glenn Miller, and Billie Holiday. These artists in particular led the transition into the calmer and smoother variations of Jazz found in the 1940s, exhibiting more linear melodies than its earlier jazz counterparts. In an interview from 1988, infamous Jazz Musician, J. J. Johnson said, “Jazz is restless. It won’t stay put and it never will.” That is precisely the attitude that continued to spread Jazz into later decades, allowing it to transform into variations of Jazz Rock, Latin Jazz, and Afro-Cuban fusions. The origins of Jazz music are as unambiguous as the music itself is lithe and impulsive. We know where Jazz came from; Jazz walked off slave ships in the hearts of those who faced unfathomable adversity. Jazz arose from adversity to provide whole communities with colorful, international collaboration, and showcasing the beauty of unity as proven by Jazz’s ability to bridge gaps of communication.